Muscat: Environmentalists were hard at work on Sunday to contain the environmental impact from the sinking of a Cyprus-flagged vessel, about 1.2 nautical miles off Sultan Qaboos Port, in which the Iranian captain of the ship died but rescuers saved the other nine Indian sailors. He revealed that Nissar 3 was carrying 816 tonnes of bitumen. 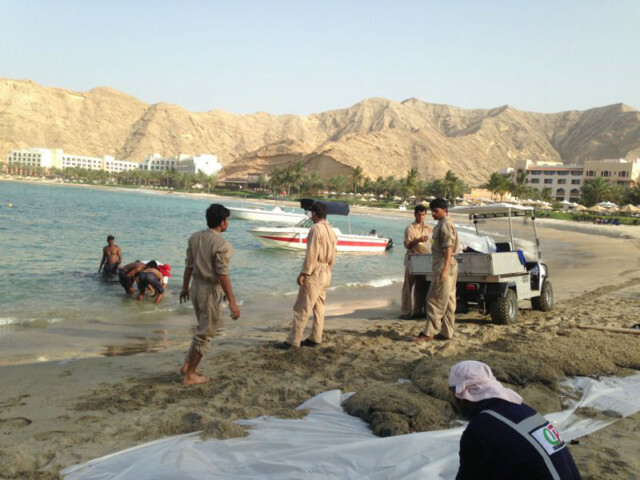 The cargo was seen floating along the coast at Sifah Beach, about 40km east of Muscat. 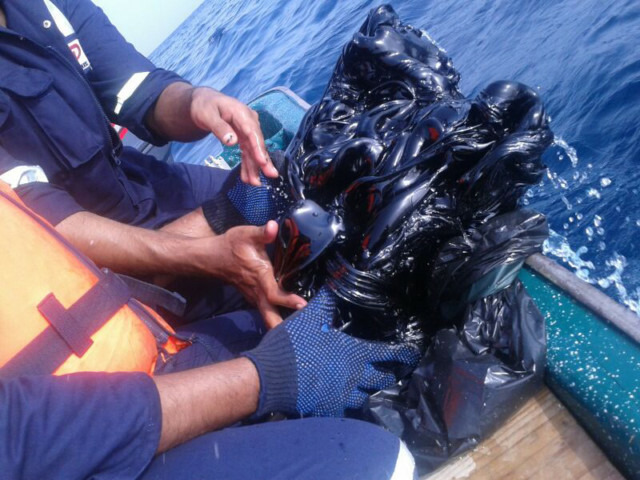 Al Akhzami said that they have sought help from private companies involved in fighting marine pollution. “We have also kept the Regional Organisation for the Protection of Marine Environment (ROPME) informed about the accident as well as measures taken to contain pollution caused by the cargo [bitumen] spill,” he said. Bitumen is a sticky, black and highly viscous liquid or semi-solid form of petroleum. It may be found in natural deposits or may be a refined product. The primary use of bitumen is in road construction, where it is used as the glue or binder mixed with aggregate particles to create asphalt concrete. The captain of the ship had sent an SOS to the Sultan Qaboos Port control tower that seawater was gushing inside the vessel and they had no facility to pump it out. The port authorities promptly rushed two tugboats but by that time the Cyprus-flagged ship had gone down and, along with the ship, the Iranian captain. His body was recovered 24 hours after the Cyprus-flagged cargo vessel sank on Wednesday. However, the Coast Guards managed to rescue nine Indian sailors and took them to the Royal Oman Police Hospital for treatment. Al Akhzami assured residents along the coastal area that the Ministry of Environment and Climate Affairs was working hard to ensure that the bitumen spill from the sunken ship is contained and doesn’t cause much harm. “The marine life as well as the desalination plants could face a threat from the spilled bitumen but we have placed booms to control possible spread of the spill,” he added. The ministry also appealed to residents to report any signs of pollution along the country’s coast.